Father Francis O'Loughlin was born in Newport, Rhode Island. He is the son of the late Francis A. O’Loughlin Sr. and Catherine O’Loughlin and the brother of 6 brothers and 2 sisters. He attended St. Anthony School, Portsmouth, and Our Lady of Providence Preparatory Seminary School in Providence. He then attended Our Lady of Providence College in Warwick, Rhode Island and St. Bernard Seminary in Rochester, New York. Father O'Loughlin was assigned as a deacon at St. Joseph Church in North Scituate and was ordained to the priesthood on June 14, 1980, at St. Anthony Church in Portsmouth by Bishop Kenneth A. Angell. 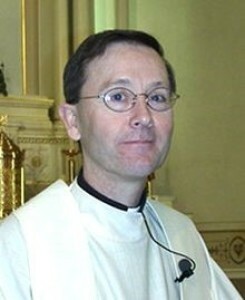 He served as assistant pastor at St. Francis de Sales, North Kingstown; St. Ann's, Cranston; and as chaplain, Rhode Island Hospital, Providence. Father O'Loughlin was assigned as pastor of Jesus Saviour Church on April 28, 1998 and as pastor to St. Joseph’s Church on July 1, 2018. He is also the Dean of the Catholic Churches in Newport County and the East Bay. Fr. Frank also serves as chaplain of Newport Hospital, the Ancient Order of Hibernians, the Newport/Middletown Knights of Columbus, Council 256, the Newport Police, the Middletown Police and the Newport Fire Department. He was honored by the Newport Elks as the Citizen of the Year in 2007; he was named Chaplain of the Year by the Knights of Columbus in 2013 and he received the Civitas award by the Newport Irish Heritage Association in 2017. During the months of September through December 2000, Father O'Loughlin enjoyed a sabbatical trip to Rome. This was a rare opportunity to experience study and travel in and around the area of the Vatican. The highlight of this trip was Father's opportunity to meet the Holy Father, Pope John Paul II, now a Saint of the Church.